At K 2013, BEKUM Maschinenfabriken GmbH is premiering its fully-electric version of the current 7th generation blow molding machines with a clamping force of 150kN. This exhibit, a two-station EBLOW 407 D blow molder, combines the modular structure of the 07 series with an energy-efficient, all-electric drive. The machine is equipped with a spiral distributor extrusion head that offers significant advantages for product quality as well as productivity. 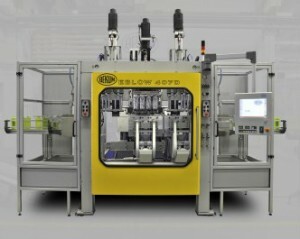 The EBLOW 407 D has a mold width of 500mm with a mold length of 470mm and a mold depth of 2x130mm. The mold opening stroke is specified as 250mm and the maximum mold weight is rated at 400kg. There is also a choice of three grooved barrel extruders with an L/D ratio of 24D, in screw diameters of 70mm, 90mm and 100mm. Their plasticizing capability varies between 110 and 340kg/h. depending on the extruder size and the material being processes. The machine has a mold clamping system known as the C-Frame, which was introduced at K 2010. With a dry cycle time of 2.5s, the EBLOW 407 D is a fast machine, allowing shorter production cycles via independent drives and parallel movements. According to BEKUM, the precise repeatability of the EBLOW 407 D sets a high standard. This results in long service life, especially with regard to blow mold cutting edges, which has a direct impact on product quality. The drive system is not only energy-efficient, but it is very precise, gentle on the molds with non-impact clamping action, and noise emission is noticeably reduced to 72dB, as compared to hydraulic designs.